to bring the poinsettias to life. 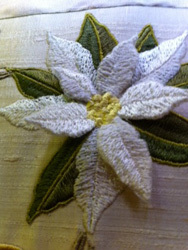 For this example I stitched the flower insert in ivory on tulle and wash away stabiliser. When it was removed from the hoop I carefully trimmed away everything. A little Fray check will hold any threads cut by mistake. 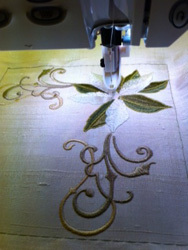 I then stitched the embroidery design and stopped it before the last but one colour, and carefully pinned the insert in place. Then I moved the design on another colour and finished it off with the yellow fill pattern, which holds the flower insert in place. May I suggest that you use some hot fix crystals in the centre of this design to give it a little more Christmas sparkle. 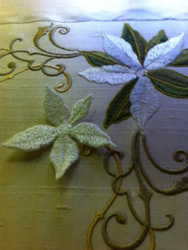 These designs can now be pre ordered at Graceful Embroidery. Excellent… that makes me want to go and EMBROIDER for Christmas! Way to go, as they say! Oh this is so beautiful! So happy I got my pre-order in and am really excited for these to be released. They are just beautiful!